“New Sensation Rock Entertainment Band” combining Shigin, Wagakki and Rock Band. The first album “Vocalo Zanmai” released in April 2014 got their fist Top 5 in Oricon Weekly Ranking, also Top 10 twice. For 22 consecutive weeks, this album was continuously ranked among the top 100. Total view “Senbon Sakura” posted on YouTube was reviewed more than 18,000,000. 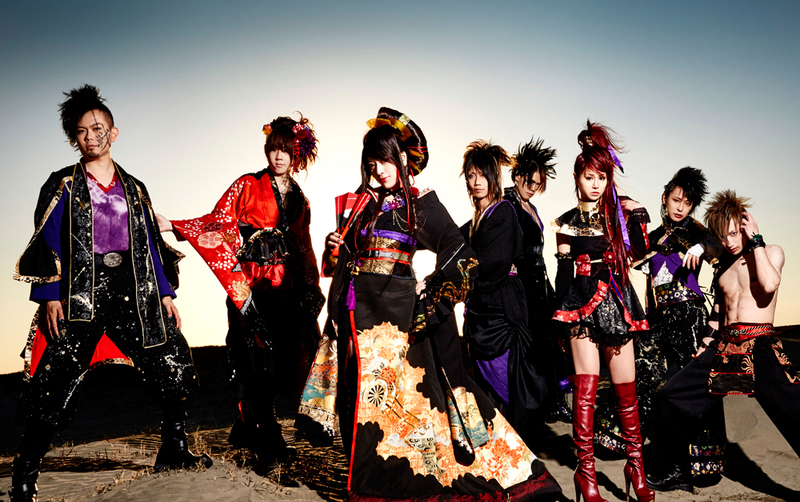 Wagakki Band appeared in “The 15th JAPAN EXPO 2014” held in Paris in July 2014 where over 4,000 people went to. This year, they announced to host the first ever solo live show in Taiwan as “THE 1ST WORLD PROJECT”. ★Album Name「Vocalo Zanmai」ranked 3rd in the Tower Record 2014 annual rankings for the 「Anime song・Singer/Voice Actor」section. ★Album Song「Senbon Zakura」ranked 12th in the Youtube 2014 Music Video section. ・August 17, 2013：Appeared in the 「Nico Nico Music Master 2 〜Uta to Ensou no Saiten〜」which marked Wagakki Band’s first live with all of the current members. ・November 11,2013：Vocaloid Cover Mini Album 「Joshou。」goes on sale at「THE VOC@LOID M@ster27」. The 1000 limited edition CDs sold out in just 3 hours. ・January 31, 2014：Performed their first solo live 「Wagakki Band Dai Shinnnennkai 2014 〜Wagakki X Band Gassen〜」at club Asia, Shibuya. Wagakki Band announced their major debut in April on this stage. ・February-March, 2014：「Senbon Zakura」’s Music Video was aired as the ending theme for the TBS program 「Rank Oukoku」. ・February 16, 2014：Yuko Suzuhana, Seishi Ibukuro, Daisuke Kaminaga, Beni Ninagawa and Wasabi appeared on 「Chou Party III Yaku 250 Mei Shutsuensha Happyou〜Shutsuensha de Sharehouse Sitemita〜」・April〜May,2014：「Tengaku」’s Music Video was air as the ending theme for the TBS program「Rank Oukoku」. ・April 11, 2014：Made an appearance on 「Mezamashi Terebi」on the Fuji TV channel. Wagakki Band appeared in the「Midori ga Madoguchi」section MCed by singer Gero. ・July 2~6, 2014：Performed at the「JAPAN EXPO 2014」in Paris, France. (270,000 Visitors in 5 days) This marked Wagakki Band’s first overseas performance and the band performed on the main stage on day 5 of the event with an audience of over 4,000. ・July 27, 2014：Performed their first solo live「Vocalo Zanmai Dai Ensoukai」 after their major debut at the shibuya duo MUSIC EXCHANGE. ・July 29, 2014：Performed at Fuji Terebi’s 「Odaiba Shintairiku Mezamashi Live」along with Gero and Tomohisa Sakou. ・August 6, 2014：Was interviewed by NHK’s 「Ohayou Nippon」Check Entertainment Section. The show aired Wagakki Band’s one man live footage at the 「JAPAN EXPO 2014 」held on July 27th. Yuko Suzuhana also showed off her Shigin skills during the interview. ・August 27, 2014：Released first original song 「Hanabi」on DVD and Blu-ray. ・August 27, 2014：Hosted additional live performance of「Vocalo Zanmai Dai Ensoukai PREMIUM ENCORE in Akasaka BLITZ」at Akasaka BLITZ. ・August 29, 2014：Performed in the opening act of「a-nation stadium fes」. ・November 26, 2014：Released LIVE DVD and Blu-ray of 「Vocalo Zanmai Dai Ensoukai」. ・January 7, 2015：Will perform first Concert hall performance 「Wagakki Band Dai Shinnenkai 2015」at Shinuya Koukaido. ・February 25, 2015：Second Music video (DVD, Bru-ray) “Ikusa / Nadeshiko Zakura” released. ・March 5, 2015：Performed First solo Live「Wagakki Band Tandoku Kouen 〜Shinn ni Musou」at Nagoya Bottom Line. ・March 7, 2015：First appearance for commercial for “KIRIN Mets” air sterted. ・April 23, 2015：Official Global Fan Club “Yae ryu” launched at April 23 as One-year anniversary since debut. ・May 9, 2015：First international solo performance “Taipei Dai Ensoukai” will held in ATT Show Box at Taipei. ・May 10, 2015：Additional First international solo performance “Taipei Dai Ensoukai ~PREMIUM ENCORE” will held in ATT Show Box at Taipei. ・September 12, 2015: 1st JAPAN TOUR 2015　will start with KAWASAKI CLUB CITTA’ as a start.